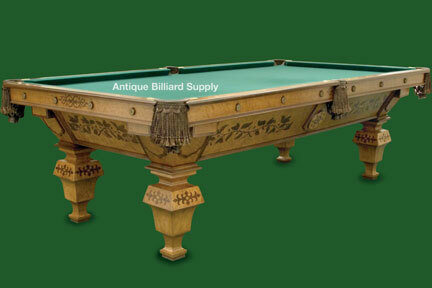 #3-07 Very old Brunswick antique pool table with design elements usually found on Stephani & Hart antique pool tables and early H. W. Collender antique pool tables. Heavily figured burl with chestnut finish. Extensive hand inlay in both geometric and floral patterns. Constructed in the 1870s, this table features the original diamond sights in the rosewood top rails. Nine-foot size with four-piece slate playing surface. Restored and available for sale.